One more push needed for public lands bill! Our beleaguered public lands could use a victory these days and they may be on the verge of getting one. Recently the California Assembly Appropriations Committee voted 11-5 to send S.B. 50, The Public Lands Protection Act, on to the Assembly floor. If you wrote to the Appropriations Committee— or otherwise supported our recent efforts to advance S.B. 50— thank you! Every American has a stake in safeguarding the health and beauty of the national forests, parks, and monuments that we all own. But the Trump Administration sees things differently. It is attempting with every tool at its disposal to open up our public lands first to state and local governments who cannot manage and safeguard them, then ultimately to private resource-extraction interests who will in all likelihood close them to public access and exploit them. We can save our public lands— but to do so will require taking action for S.B. 50 to ensure its victory on the Assembly floor! California is well-endowed with federal lands, including nine million acres of national forests and some 45 million acres of U.S. lands and coastal waters overall. S.B. 50 would direct the California State Lands Commission (which has jurisdiction over much of the federal land in the state) to exercise a right of first refusal with regard to any proposed federal lands conveyance or sale to other parties. Now the measure faces its last full floor vote. 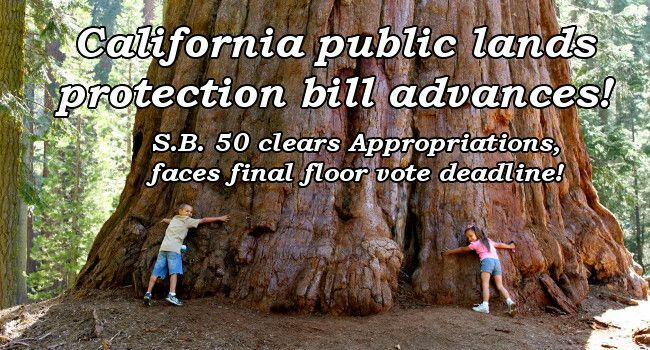 It must pass the California Assembly by the close of business Friday! Tell your Assemblymember to save our public lands by voting AYE for S.B. 50! Here is the state legislature's web page on the bill's status.